George Stephenson (1781-1848) was one of the all time great engineers. But you already knew that. What you probably don’t know are all the wonderful things we can learn from him that will improve our model railway building. George Stephenson is one of my all time heroes. 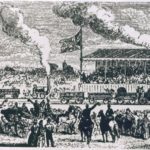 The “father of railways” came from humble beginnings, and despite not being able to read until he was twenty, he ended up with vast wealth, international fame and owning a huge country estate. He developed not just the ‘locomotive engine’ but a worldwide standard for rail-tracks that’s still in use today. And to go with the track and trains, he built bridges, tunnels and other civil engineering works around them that were unprecedented for their size and technical innovation. And if that wasn’t enough, he also invented a mining safety lamp, devised a way to grow straight cucumbers and pioneered an early form of battery chicken farming. He was the original railway engineer and I’ve learnt some of my most important lessons about building my tiny railways from him. You’re George Stephenson, you have an idea for something completely new, a revolution in engineering in fact, but have no idea how to create it. Experimenting with full-size engines would be too expensive. What to do? Create a trial version in the model form of course. Throughout his life, Stephenson experimented and worked out his ideas by making small models first. And this works just as well for our model railways as it did for Stephenson’s locomotives and steam machines. No, I’m not talking about creating models within models such as the model railways in model villages so beloved by @timdunn although they are very cool. Instead, do what Stephenson did and practice and perfect the design of your ideas in a model form first. 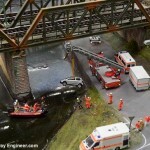 Specifically, if you have a bridge or building planned for your railway, make up a rough version of it. Try its construction and position before starting on the real thing and avoid frustrating and expensive mistakes. Specifically, if you have a bridge or building planned for your railway, make up a rough version of it. Try its construction and position before starting on the real thing and avoid frustrating and expensive mistakes. > What structures – bridges, viaducts and stations – do you have planned? Take a hint from the father of railways and test their construction out first with a model. George Stephenson was clever, but more than that – he had vision. He alone saw that all the individual railways being built would one day need to be connected. Unlike his rival to the railway crown, Isambard Kingdom Brunel, he realised that railways should be built to the same gauge to enable this. Planning ahead on your railway will save lots of work and heart ache later and I always try to think about the long term when planning my layouts. As a result, my current baseboard is built to be extended and I’ve designed in spurs for easy connection to other circuits. > What might you do with your layouts later? Think of what you can do now that will make things easier in the future. Most people know of George Stephenson for his steam locomotives. But he also dabbled in model building and his choice of material has become one of my favourite materials for railway modelling: Clay. Aged just 8 years old, Stephenson would use clay from a bog at Dewley Burn and to make models of the steam pumping engines he’d seen around the coal mines where his father worked. Clay is a railway modellers best friend. And it’s ideal for model railways. It’s cheap, long lasting and very adaptable. 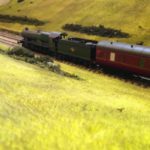 It’s used to improve the look of track sides, add texture and realism to foam board buildings, road surfaces and on its own to make small stone work constructions – dry stone walls etc (master model maker Iain Robinson is a guru of clay stone work. 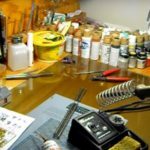 Sadly his blog is no longer available but there’s an archive of one of one his pages on his techniques here). I use it to add a natural look to the foam-board walls of my Tin mine. It can also be used as a mould for metal casting, wheels and the like. > What structures on your N or OO gauge railway could you make from clay? Improve your railway with improvements, like Stephenson did the Blücher, his first steam train. I was dead proud of my early railways. They worked and I was so chuffed with them, much like Stephenson must have been when he built Blücher, in 1814. It was the first ever rail locomotive and could pull a train of 30 tons at 4mph up a gradient of 1 in 450! But the Blücher repeatedly broke down and its power and weight chewed up the tracks. And if truth be told, my layouts weren’t that reliable either. What he did, and what we can all learn from, is to never stop tweaking and improving our work. For Stephenson this meant changing the steam flow, so increasing the efficiency of the boiler, and producing more power and improving reliability. For me, I’m on my third signal box for my Cornish layout, replacing the polythene windows and weathering the external paintwork and not stopping until I’m happy with it. Equally, my under board electrics have undergone constant rewiring. While Stephenson mastered steam, I’ve mastered the soldering iron! >Take a look at your layout, what needs improving? What can you do better? 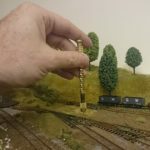 Track work, scenery, buildings, electrics? Pick one and improve it today, George Stephenson would. Lastly – but perhaps the most important thing I’ve learnt from the great man – is to mirror his approach to track work. He worked out that smooth track was critical for the running of reliable trains and wouldn’t compromise on the quality of the rails. Before he figured it out, the track on experimental railways was uneven and poorly built. This was most evident when he was asked for his choice of rails for the Stockton and Darlington Railway. 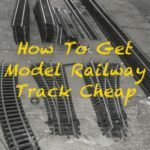 He had a patent on cast-iron rails and stood to gain significant financial reward by using his design but when asked which track should be used for the new line he recommended an alternative, malleable rails. His logic being that malleable rails were stronger and thus cost less to maintain even though it cost him £500. The importance he placed on having good track work can also be seen in his creation of the half-lap joint. His joint reduced the jolt on the wheels as they rolled from rail to rail to prevent derailments and improve the ride. Learn from Stephenson when he invented the half-lap joint. As you’re reading Model Railway Engineer, I’m guessing that you’re laying your own track so follow his lead. 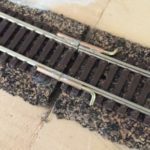 For me, this means avoiding inclines where possible – with the exception of when I want inclines for interest or when reflecting a prototype landscape – and rigorously testing my track joints to give a smooth transition between rails. Not doing so, in the great man’s own words, will leave owners facing “no end of expense for repairs”. These are just five of the many things railway modellers can learn from the “father of railways”. If you’d like to know more about George Stephenson, I recommend The Lives of the Engineers. George and Robert Stephenson by Samuel Smiles. It’s a fascinating insight into their lives, with bags of detail not only on how railways evolved but the people of the time and problems they faced and an inspiring read. Who has inspired you to build your model railway? Add a comment below and I’ll look into writing a profile of them too. Hi, you shouldn’t get these anymore. Let me know if there’s anything else I can help with. Thanks Andy.